The bee population is drastically decreasing due to pesticides, habitat loss, parasites and other environmental factors. Bees are already dying because of what humans have done to the planet. Why should we continue to treat them poorly and make them live in cramped conditions to produce one jar of honey for our pleasure? 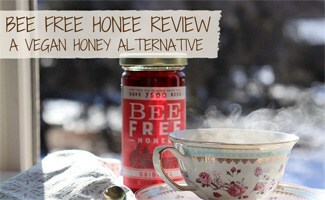 Thankfully Bee Free Honee is a vegan alternative to traditional honey, and it doesn’t require a single bee to produce. How Can I Save The Bees? *Botulism is a type of food poisoning caused by a bacterium growing on improperly sterilized preserved foods. What Do People Think Of Bee Free Honee? Bee Free Honee has grown rapidly partially thanks to its appearance on Shark Tank. The sharks knew this product was unique and greatly needed, so they all fought to be involved in the investment. You can watch the clip below. We understand that there are benefits to consuming raw honey, so this vegan honey alternative may not be for everyone. However, if you use honey for the taste, we suggest you give Bee Free Honee a try, especially if you are vegan. You most likely won’t notice a difference, but you’ll make a positive impact on the environment by consuming bee-free honey. If you’re interested in helping save the bee population, consider raising your own honeybees and becoming a beekeeper yourself. Learn more about the extinction risk that honey bees face today. What ideas can you share about how we can save the bees? Like This Article? Sign Up for More Earth-Friendly Tips and Advice! One of Kimberly’s favorite things to do is cook. She is trying her best to be more conscious about the nutrients she puts into her body and enjoys trying new recipes. Kimberly grew up helping her dad with the family garden and hopes to have her own garden some day. She enjoys brightening up her dishes with the food mother nature can provide and enjoys composting her produce scraps. Vital Choice Review: Is It The Best Sea-To-Table Home Delivery Service? All Content © 2019 Cover Story Media®, Inc. All Rights Reserved. Earth's Friends® is a trademark of Cover Story Media®, Inc.